I have some photos about how to repair a hole. I'll find them and attach them later. I put a silver dollar size hole in the side of this boat last fall, trying to gun the 20hp throttle and the boat up onto a half submerged trailer in a wind storm. A big gust hit the front of the boat just as I got there and I hit the corner of the trailer with the front side of the boat. Going fast. Date stamps on my first photos of this boat show I built it ten years ago. This was the first round of real repairs. This boat is OK rowing on the river but not really that good. It slows down well but turns too slowly for my tastes. That's because it is so flat bottomed, which I made because I wanted to use a motor. Still. If I had it to do all over again I would change a lot. 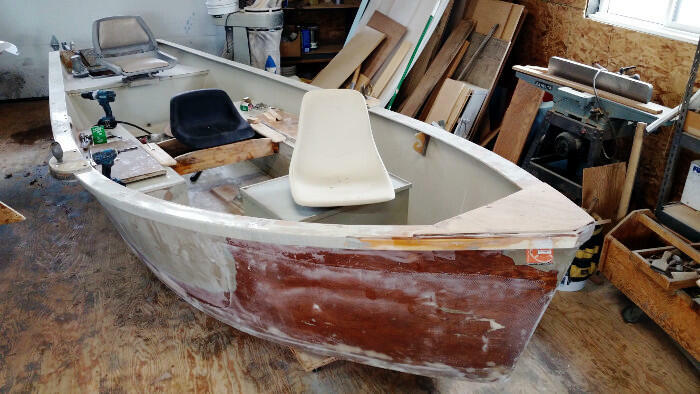 Once I get this out of the shop I'll get back to work on one last boat. This it for me. From here on out it will be boat repairs only. I'm old and my back is sore. And I want to fish now more than build. On this subject of repairs, I'm looking for a fix. Over time the bottom of my boat has taken a few hits and the outer skin has cracked all the way through to the cells. Every patch I have made is not holding. With the epoxy in a state of full cure, there is no epoxy bond between the new patch material and the original epoxy. The bond is mechanical into the sanded service, it is not a cross link bond like we get with fresh layers of epoxy. Sanding with 40 grit to make it rough is just not working. When the bottom flexes it separates. I'm looking for a new way of doing this. I have a feeling that a sheet of glass could be epoxied to plastic then pealed off. Next glue it over the bad spot with something like 5200, that stuff will stick to anything but, it takes 5 days to cure and then could I ever get it off if another repair is needed? I have delaminated plywood trying to get 5200 bonded parts separated. Perhaps there is another epoxy which will allow more flex preventing cracking. With the millions of types of materials and adhesives, the answer is out there but finding it is the difficult part. If there is something new we don't know about great. I too have had little luck with small patches on the chine or bottom. If that's all there is. I usually make a small patch as best I can. Sand the surrounding area. Feather edges. Wash with acetone. Patch the hole with silver dollar size circles up to maybe a 6" inch square patch of tape. Then cover the entire bottom, right over top the new patch, with an end to end side to side new layer of glass, wrapping the chine a bit too. After 30 years of patching every five years like that you might end up with too much glass on the bottom. But I'll be a dead f%$#@r by then anyway. 30 years from now. So I'm not worrying about it. I did cut a bottom completely off and replaced it once. That's a long how-to-do-it story but the punchline step was using a water feed concrete saw to cut through the old fiberglass. The rest was just work. That was the first or second Honky Dory, originally built in 1987. Not sure when I cut that bottom off exactly but I replaced an end grain balsa wood bottom with Plascore. So if I thought about it hard enough I could probably figure out when exactly.